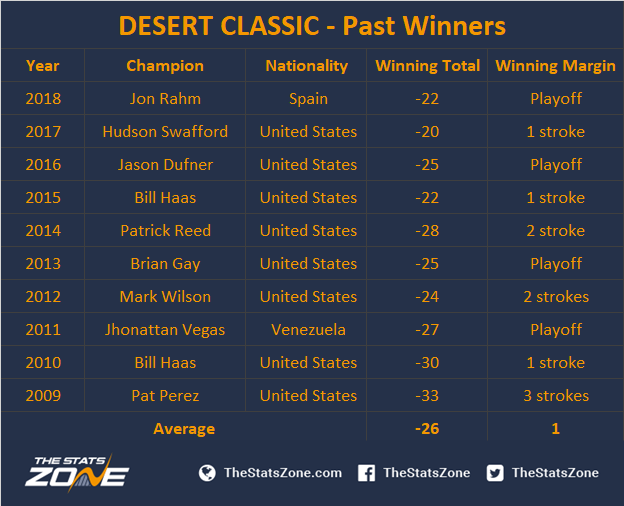 The Desert Classic has typically been a birdie-fest with an average winning total since 2009 of 26 under par. However, the tournament was played over five rounds but was moved to the traditional 72-hole format in 2012 with the average decreasing to 24 under – still very low scoring. Notably, the winning margin has on average been just one stroke with four playoffs since 2009, suggesting the layout suits no particular style of play, rather just an attacking approach throughout and a ‘hot’ putter needed to contend. 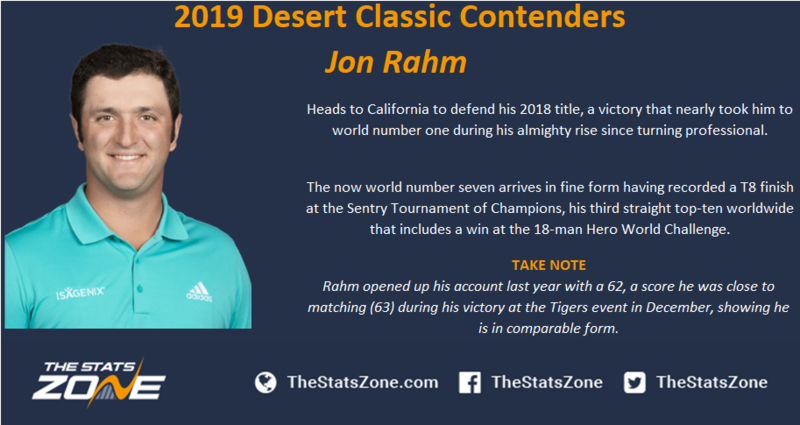 Jon Rahm heads to California to defend his 2018 title, a victory that nearly took him to world number one during his almighty rise since turning professional. The now world number seven arrives in fine form having recorded a T8 finish at the Sentry Tournament of Champions, his third straight top-ten worldwide that includes a win at the 18-man Hero World Challenge. Rahm opened up his account last year with a 62, a score he was close to matching (63) during his victory at the Tigers event in December, showing he is in comparable form. Adam Hadwin has just one PGA Tour victory to his name so far - the 2017 Valspar Championship. The Canadian has two top-ten finishes already on tour this season, just one fewer than his total last season. 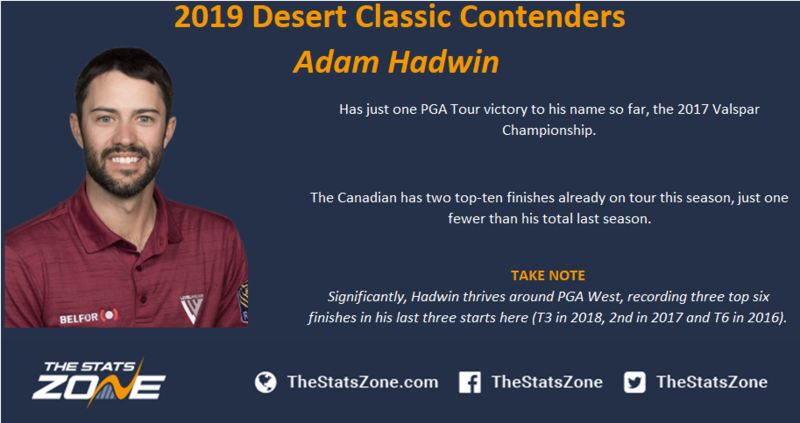 Significantly, Hadwin thrives around PGA West, recording three top-six finishes in his last three starts here (T3 in 2018, 2nd in 2017 and T6 in 2016). 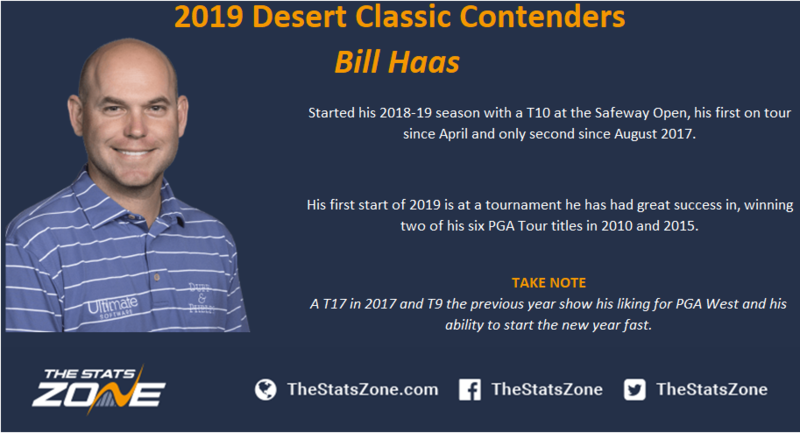 Bill Haas started his 2018-19 season with a T10 at the Safeway Open, his first on tour since April and only second since August 2017. His first start of 2019 is at a tournament he has had great success in, winning two of his six PGA Tour titles in 2010 and 2015. A T17 in 2017 and T9 the previous year show his liking for PGA West and his ability to start the new year fast. 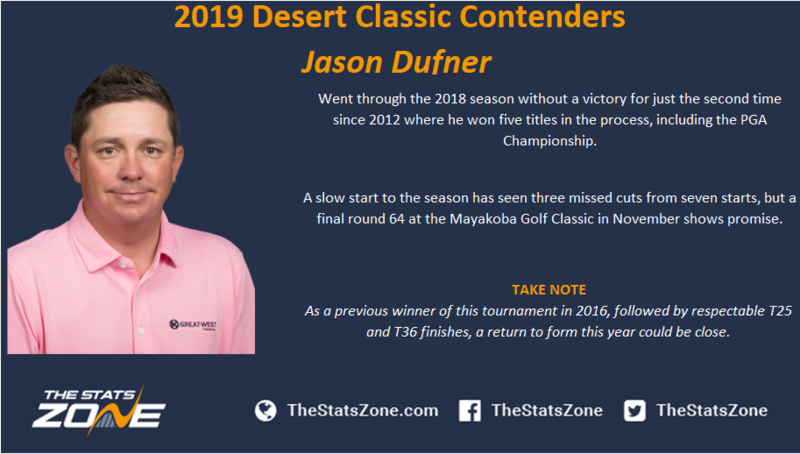 Jason Dufner went through the 2018 season without a victory for just the second time since 2012 where he won five titles in the process, including the PGA Championship. A slow start to the season has seen three missed cuts from seven starts, but a final round 64 at the Mayakoba Golf Classic in November shows promise. As a previous winner of this tournament in 2016, followed by respectable T25 and T36 finishes, a return to form this year could be close. 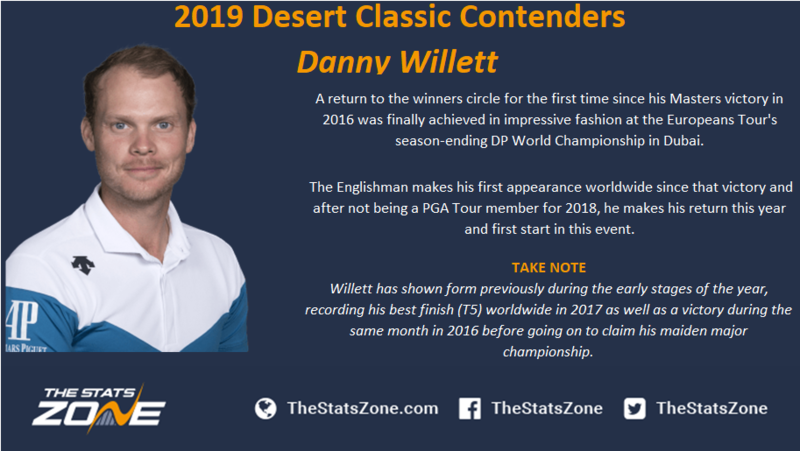 Danny Willett’s return to the winners circle for the first time since his Masters victory in 2016 was finally achieved in impressive fashion at the European Tour season-ending DP World Championship in Dubai. The Englishman makes his first appearance worldwide since that victory and after not being a PGA Tour member for 2018, he makes his return this year and first start in this event. Willett has shown form previously during the early stages of the year, recording his best finish (T5) worldwide in 2017 as well as a victory during the same month in 2016 before going on to claim his maiden major championship.